In a single year, the political climate has changed rather drastically all across the globe. Just take a look at America, the U.K., plus select countries scattered throughout the Middle East, and you’ll be able to see firsthand how certain political issues have swung from one side of the argument to the other. Better yet, read the following comic book! It was created by Charles Soule, Stefano Landini, and published by Marvel in November, 2017. TO QUOTE Donald Trump: 'What separates the winners from the losers is how a person reacts to each new twist of fate'. 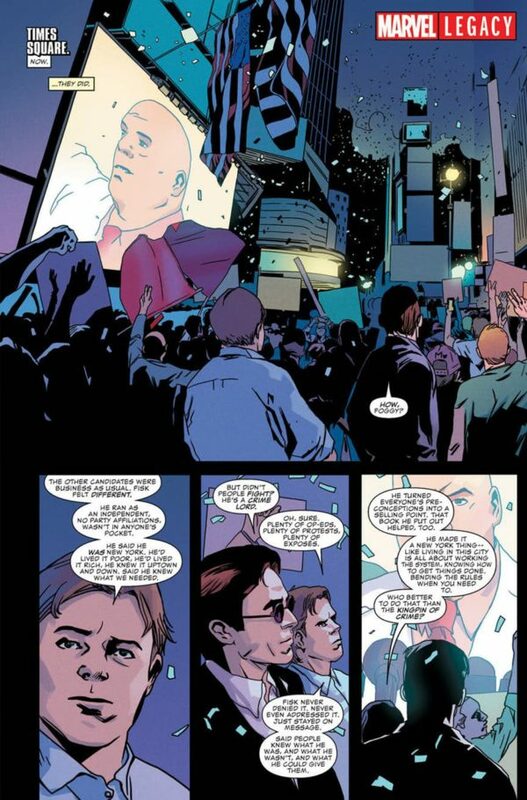 Quite recently Wilson Fisk has been appointed the new mayor of New York City. It's shocking, I know, so you've got to ask yourself what are you going to do about it? Laugh? Cry? Protest? Wear a red hat? 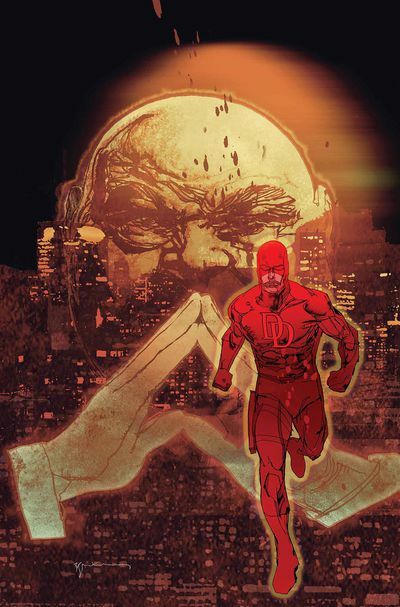 Or better yet, why don’t you do the same thing that Matt Murdock wants to do, that being to rush off to his place of work and attempt to investigate Wilson’s dubious victory! After all, a few months back, it looked like Wilson was completely out for the count! Not only because Daredevil was able to evade whatever he threw at him, namely, the villain Tombstone, but in addition to this, Matt was also successful in winning a court-case that allowed superheroes to testify in a court of law. Now though, well, now he’s the f**cking mayor of NYC, and to make matters even worse, Matt isn’t allowed to investigate his success, yet he is encouraged to track down and prosecute vigilantes for being unsanctioned crime-fighters, vigilantes such as Iron Fist, Luke Cage, Spider-Man, and of course, Matt’s red-suited alter-ego. So in retaliation to all of this, Matt decides to suit up and fight back in the only way he knows how. And what does that entail exactly? Does he ignore his superiors and carry on regardless? Does he jump into action and get caught by the police? And if this does happen, which it most probably will, ouch!, why would the arresting officers want to take him to the new mayor? To find out the answers to some of these questions, plus a few more, if you’re lucky, please pick up issue 595 of Daredevil today. In the meantime, though, feel free to check out my opinions on it by reading the following three points. Point One) POLITICAL PLAY-TIME: Before you read the following section, please keep in mind that I’m not left-wing, I’m not right-wing, if anything, I’m actually Nightwing, ha! Seriously though, generally I’m not what you would call a political person. At best I’m slightly left of center, although I occasionally research the subject when it comes up in a historical context. By definition I’m more of a humanist than an economist, despite acknowledging the fact that these two definitions aren’t always mutually exclusive. That said, however, the one thing about this issue I wasn’t too keen on was how it attempted to play off of today’s political climate. Well, let’s face it! Wilson Fisk is supposed to represent a Donald Trump like figure who somehow managed to wrangle his way into a political place of power. 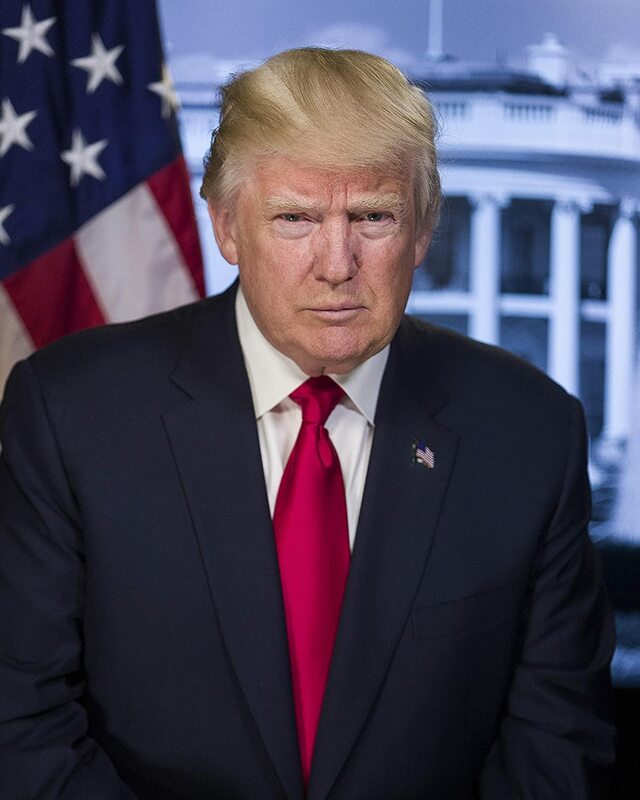 But, to my knowledge, Trump isn’t a crime-lord or as physically imposing as Fisk, so to put the two of them together in the same category somehow seems slightly biased, almost as if there is a secret agenda hidden within the narrative that wants to demonize POTUS (No offence, Charlie, mate). There are many examples of this scattered throughout the adventure, sometimes reflected within certain statements spoken by either the hero or the villain, whereas at other times it can be seen in terms of plot-points or structural objectives. Along similar lines I can say exactly the same thing about the sudden change in Daredevils personality. Previously he came across as being the type of hero who would gestate on a scenario before jumping in, head first, with the intention of stopping it. Or at the very least, he would try to come up with a plan which would give him some time to figure out what he eventually wanted to do. Now though, he seems more like a reactionary figure, militant even, as he wants to take down Fisk regardless of any long-term objectives. Point Two) STORY BEATS: This point brings me quite nicely onto the story-line itself. Despite not being a big fan of some of its political leanings, that’s not to say that I didn’t thoroughly enjoy reading Charles Soule's script. Generally the first part of a much larger story-line isn’t always the most fulfilling section to read, and I say this because it’s normally very plot intensive, and sometimes ignores the characters and the personalities involved. Not so in this case, however, because during this episode everyone’s motivations were spelt out fairly clearly, yet not so clearly that it made the overall premise a predictable one to follow. 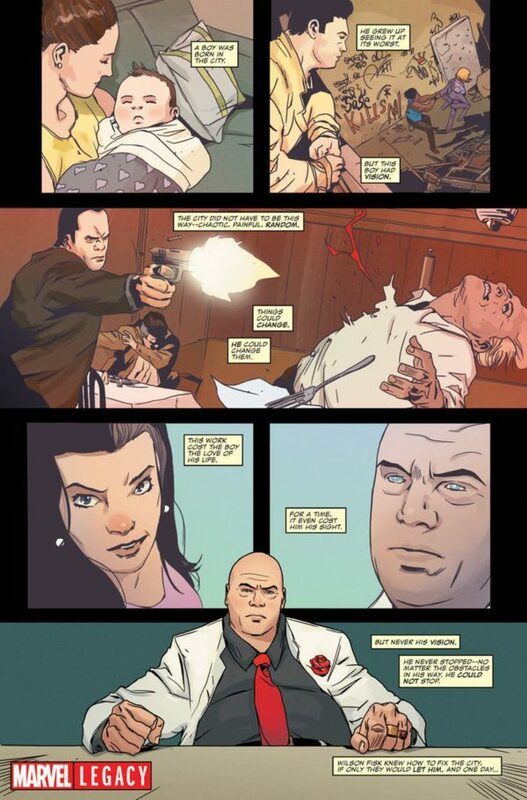 A good example of this can be seen during that sequence where Matt speaks with Ellen about wanting to take Fisk down. Instead of the scene coming across as a one-sided argument, backed up by Matt’s previous encounters with the man, Ellen turns the tables on him by presenting a contradictory viewpoint which makes him question his own motives. I also enjoyed reading the previous scene, as it reinforced the notion that Wilson became mayor in order to counteract Matt’s prior legal objective (i.e. that one where superheroes are allowed to testify in court). Seriously, what a conniving sod that man truly is, literally becoming mayor for a whole city just so he can stamp his feet, rattle his cage, and show his archenemy that no one can push him around. For the time being, anyway, because knowing Matt, he’s bound to figure something out sooner or later. But what could this something be, I wonder? From the looks of it, Wilson has the upper hand, both politically and legally, especially since Matt has to oppose his fellow heroes so he can continue to do his job. Also, how do you think they will react? His comrades I mean. Will they even care about this news or will they be annoyed by it? Plus what steps will Matt have to take so he can take on a mayor? Point Three) THE WRITING IS ON THE WALL: Over the last year this series has had a variety of different artists assigned to draw it. Some were good, some were bad, and some were just damn right confusing. This month, however, we were lucky enough to have someone who fell into the initial category, Stefano Landini. In many ways his style of artwork resembles that of P Craig Russell and Michael Lark, two Batman artists that are normally known for their surrealist depictions peppered with clean and expressive neo-noir overtones. Yes. I do know that what I just said sounds pretty damn wanky! But hey! I’m just telling you how it is. Stefano is a great artist and his work on this book really shines through. His fighting sequences are logically composed and full of drama and action. His dialogue sequences are cleanly established and flow in a very pleasing way. 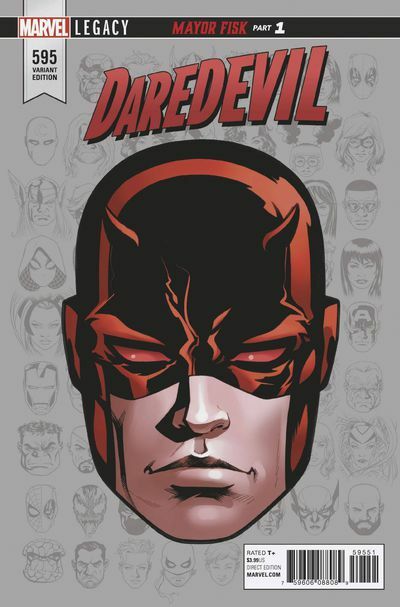 Plus on top of that, I really love the way he draws Daredevil. It’s similar to the way more recent artists have drawn Batman, like Jason Fabok for instance, albeit with a tougher attitude and a street-level grace. I also have to congratulate Matt Milla for the use of his muted color palette. Overall his de-saturated hues reinforced the noir like atmosphere Stefano has put in place, plus I particularly liked those monochromatic sequences which were re-enhanced by a splattering of blood red dye. Lovely stuff. Bob Dylan once wrote the song, ‘The Times, They Are a Changin’, because he thought it would compliment the aforementioned adventure. OK. Scrap that for a logical reason. My bad! Rabbi Dylan wrote the song because his watch accidentally broke and he needed to buy a new one. Yahooo! Musical match-up made!!! Should I? I mean, given to what I’ve just said, should I actually compare this comic book to a known political figure who would probably look a bit better if he were bald? Oh sod it! I might as well, eh? Besides, I’ve already added his picture, so I’m sure it would seem rude if I did otherwise. This comic book is Donald Trump, just because, ha! Ultron: He did pretty well until he was caught making love to a washing machine. Hitler: Not a great candidate, because not a lot of people agreed on his mustache. Jack The Ripper: He did very well after making an appearance on Iron Chef. Taylor Swift: She didn’t do very well after making an appearance on Iron Chef. Hillary Clinton: The poor cow can’t win anything. Hilary Duff: See previous answer for more details. Genghis Khan: He has a nice mustache. Donald Trump: Oh, there’s always one joker in the pack.